Makoto and Minako both fall for an attractive kindergarten teacher, but Minako's all-out attempts to ingratiate herself with him soon annoy Makoto. 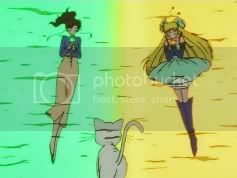 Sailor Jupiter and Sailor Venus both got new attacks and transformations in this episode: Sailor Jupiter used Jupiter Crystal Power, Make Up and Jupiter Oak Evolution, and Sailor Venus used Venus Crystal Power, Make Up and Venus Love and Beauty Shock. This was also the first and only time the background music for the Jupiter Crystal Power transformation was used. This was the second of two episodes in which Minako and Makoto got into fights and "ended" their friendship, as well as gained new transformations and attacks. The first instance was in episode 65. The song Minako sang in this episode was "Route Venus." In the Korean dub she sang a translated version of "Moonlight Densetsu." In the German dub she sang a translated version of "Ai no Senshi." In the Catalan dub she sang a translated version of ""Rashiku" Ikimasho." In the Hebrew dub the song was replaced with a translated version. When the Inner Senshi reacted to JaraJara Jou's appearance the tail end of Sailor Mars's back bow was left uncolored. This page was last edited on 26 October 2015, at 04:31.